- Click on empty space: generate new "Flower in Gear"
make balance between all flowers in screen and fill flower guage on upper left. and avoid Red Gear(once gear lost it's flower inside, gear turns red to be greed like cancer cell) fill gear disaster guage on upper right. This game says "Everyone connected / Related and greed need to be controlled before too late, if we want to move toward the Utopia". 1. Don't left single Gear-Flower alone. each one can't grow up without relationship. rotating direction is important. - if rotations match, flower will be bigger. 3. Make Connected Gears' size as equal. Click big gear to make smaller and slower. if connected one is too bigger than other, big one will exploit small one. 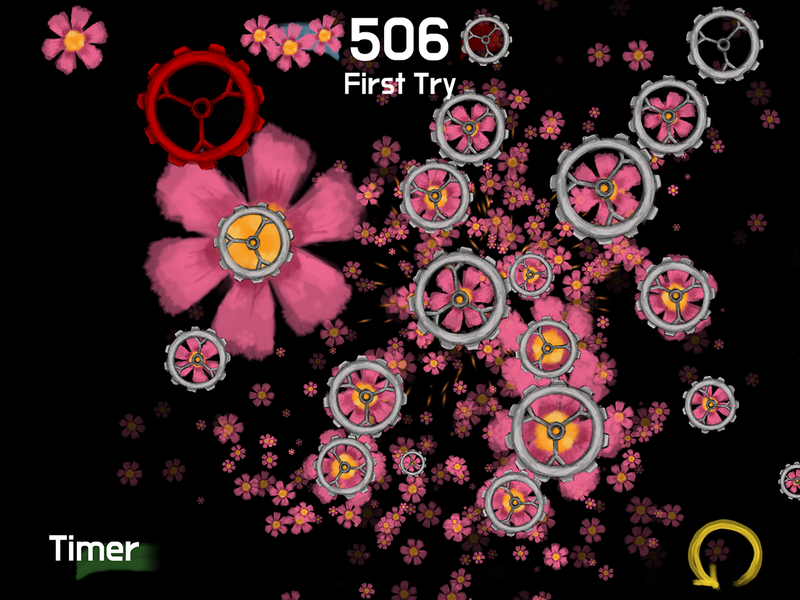 Faster gear rotates, flower shrink smaller then only hollow gear will be left. Once flower lost, Gear will be driven by desire to grow bigger. if small greed gear(red) left alone this gear will be disappear. but If greed gear(red) is connected to other, this one will exploit others. DON'T FEED GREED GEARS BEFORE GROW.